Click on the "Tools" menu, and then click on "Accounts...". Click on the "Mail" tab, then click on the "Add" button, then click on "Mail". In the "Display name" box, type your first and last name. Click on "Next". In the "E-mail address" box, type your e-mail address. Click on "Next". The incoming mail server is a POP3 server. In the "Incoming mail (POP3, IMAP or HTTP) server" box, type "mail.colosseum.com". In the "Outgoing mail (SMTP) server" box, type "roam.colosseum.com" if you are using dial-up, or "cmail.colosseum.com" if you are using DSL. In the "Account name" box, you should already see your userID. You should not need to change it. Type your password in the "Password" box. Make sure that "Remember password" is checked. DO NOT check "Log on using Secure Password Authentication (SPA). If you check this it will not work. 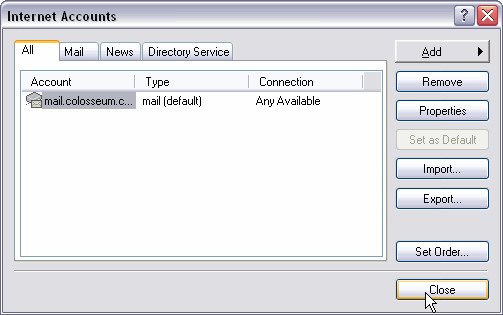 If you are using a Dialup account highlight the newly created account and click on the Properties button. A new window should open, click on the Servers tab at the top. Make sure the box labeled My server requires authentication is checked then click on the Settings... button. Select the Log on using option and enter your account name username@roam.colosseum.com and your normal password. Click OK to close the "Outgoing Mail Server" window, now back at the "Properties" window click on the Advanced tab. Beside Outgoing mail (SMTP): change "25" to "465"
Click OK to close and save your settings. Click on the "Close" button. Your E-mail is now set up. We recommend restarting your system so all changes take effect.